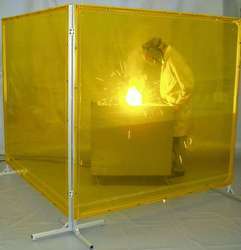 Our product range includes a wide range of weld screen. We are engaged in providing a wide range of weld screen, which is designed to save energy, protect workers, and reduce noise in warehouse and factory applications. These are specially developed for doors that enclose areas where welding is being performed. Owing to the tinted color, it helps in reducing the incidental effects of bright, ultra violet light from welding arcs and sparks bounce off the thick material. Looking for Weld Screen ?